​​​​The martial art of Aikido is known as the "Martial Art of Peace" and offers a non-competitive, yogic healing approach to the classical Koryu arts of the Samurai Bujitsu of old Japan. The goal of the student is to learn to integrate and blend with all forces, including those of an attacker. Training presents a student with vigorous physical challenges and supplements the students spiritually with meditations and centering practice. Aikido also exists as an international language of martial transmission and training and offers a cultural outlet to engage peoples all over the world. The Aikidoka will over time experience a change in perspective and heighten one's perception, mental focus and physical ability. 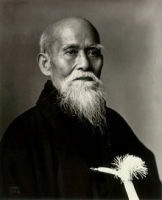 In the same way Yoga develops the person, so will Aikido with the added benefit of self-defense skills and camaraderie. Want to Join? Come by any class time, but call 318-469-1952! Make a personal commitment today! $85/ Month or (Sliding scale) $25-$45 student rate to cover whole month of night classes, but truly, Any gift welcome.